Our standard chip racks are made of clear, heavy duty plastic and hold 100 chips. Fat Louie Chip Racks comfortably hold 100 11.5-gram chips. 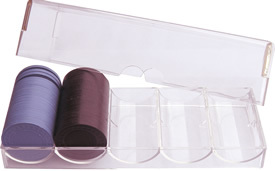 These wide size chip racks are also made of heavy duty clear plastic. These clear Acrylic Chip Racks hold 100 8 gram or 10.5 gram casino chips (please note: the racks cannot fit 100 11.5 gram chips). The Chip Racks feature a solid, heavy-duty make. These heavy-duty clear Acrylic Chip Racks feature a Lift-Lid that nicely secures the casino chips. Our Lift-Lid Acrylic Chip Racks can accommodate 100 4 gram, 8 gram, or 10.5G chips (please note: the racks cannot fit 100 11.5 gram chips). These heavy-duty red plastic racks hold 100 chips each. Please contact us at 1-800-233-0828 for pricing, FREE Chip Samples and a Catalog, or ordering information.